Without further ado, here’s the good stuff about our cycle adventure with three kids 6 and under. I think these pros would apply to most adventures with young kids. We were very fortunate to meet some wonderful new friends on our trip, and it was so wonderful to share our travel stories. We stayed with some wonderfully generous people on this trip. For me, the whole point of travelling is exactly this: meeting new people and seeing new perspectives, sharing stories, and being involved in the day-to-day of locals. Touristy destinations, while they have a time and a place, are just not my favourite. When hubby and I did our Great North America Swing Road Trip back in 2008 (pre-kids), we stopped in Banff, and I thought the place was realy overrated. It just felt like a string of commerce for tourists in the main area of town. Then we went to Revelstoke, where you can see the mountains from anywhere in town, and where we stayed at a cheap hostel and had conversations with some amazingly friendly people. The stores were all mom-and-pop shops, and we had such a wonderful time. So wile some people think we’re totally nuts for staying with and hosting total strangers, that’s the way to travel for us. The world is a lot less dangerous than people think it is, and there’s a lot more good out in the world than the media would have you believe. You just have to put yourself out there to experience the goodness of people. That’s not to say I don’t enjoy doing the touristy stuff – I fully intend on taking an all-inclusive vacation one day – but that’s just not the way I’d like to travel regularly. That’s a treat for once in a while, maybe once or twice in a lifetime. Travelling, for me, needs to be done in a more adventurous way. Staying with strangers and making new friends while taking our kids along for the ride taught the kids some wonderful lessons about kindness and friendship that may be harder to learn if we were travelling by more comfortable means. Adventuring by bicycle with kids provided us lots of exercise, and showed the kids that being active is not just important, but also a load of fun. The kids weren’t overly active on the bikes, since I pulled the younger two in a trailer, and K-girl figured out pretty quickly that she could put her feet up on the frame of the bike to avoid pedalling. But we also stopped at at least one playground (often several of them) per day, and the kids were super active while playing at these spots. We can tell our kids that being active is important, but until we offer the opportunity for them to actually do it, we’re not really showing them. And kids learn a lot faster by doing them by hearing someone lecture them. Adventuring with young kids teaches them important lessons about being flexible. These lessons will come in handy later in life, when they have to adjust to changing environments, be it at work, school, or play. Whereas we didn’t go full out survivor mode on this trip, we did do a bit of camping and making do with what we had on hand. This teaches the kids to be ready for whatever may come in the future. Teaching these lessons in a controlled environment is a lot more convenient and safe than doing it when tragedy strikes. By far the best part of adventuring with our kids was all the wonderful quality time we got to spend with them. We enjoyed being with our children all day long, day in and day out, without the usual everyday stresses of life. While many “experts” will argue that children need routine, I don’t agree that this is true all of the time. I think for some kids, yes, routine is key. However; for others, getting out of the routine is often a better way to go. Too much routine can become boring for some kids, and when boredom strikes, so does annoying behaviour. We truly enjoyed the unknown – not knowing exactly where we’d sleep the next day, meeting incredibly generous strangers, seeing new places and enjoying new sights. These are experiences that we will cherish for a long time to come, and we are hooked. We’re looking to find ways to make this happen more frequently. Location-independent work would be amazing. We’ll keep you posted. Most of our experience adventuring with kids was simply amazing. But there are a number of downsides to be aware of if you decide to hit the road with young ones. Our favourite way to travel is by staying with other travellers. It’s so wonderful to meet other people who share our passion for adventure and hear their amazing stories and experiences. Unfortunately, I tend to get attached to people, and so does our oldest kid. She asked about a cycling couple that stayed with us for about a year after the fact. 6 months after our trip was over, she still asks to visit the friends she made during the trip. It’s wonderful to make new friends and meet new people, but it’s hard when you don’t know if/when you’ll see them again. This is hard on us but also on children who easily get attached to people. Having said that, it’s just one more motivator for us to find a way to sustain a location-independent lifestyle. One of the cons of our adventure with children is that we learned about gear the hard way. After 225 kilometers without bike shorts, I finally learned that it’s sometimes it’s better to save your a** (literally) than to save your money. While our Wehoo trailer is great for commuting around town, it was definitely not the best choice for bike touring. We did fall over a couple of times, and it wasn’t fun (for me or the kids). Having said that, no one got hurt, and I do enjoy learning by trial and error. So it’s all good. We attempted not to ride when we knew it would be raining. Unfortunately, the weather people don’t always get it right, and we did get caught in rain – and once in a thunderstorm. The kids were wet, cold, and miserable (as were we), and it breaks your heart to see them so uncomfortable. I would like to formally thank and recognize the inventor of lollipops, George Smith. While we understand lollipops aren’t the best thing for children’s teeth, they sure do keep kids entertained on long rides. We plead guilty as charged for bribing children with lollipops during this trip – and they had a lot of lollipops. When we knew we had to ride a bit longer than 10 kilometers (our standard ride before stopping for breaks), we gave the kids lollipops, because it takes a long time to eat them, and it distracts the kids. But we are probably going to pay for it later – with dentist bills. Having said that, we take comfort in the fact we brush the kids’ teeth several times a day and help them floss every night. 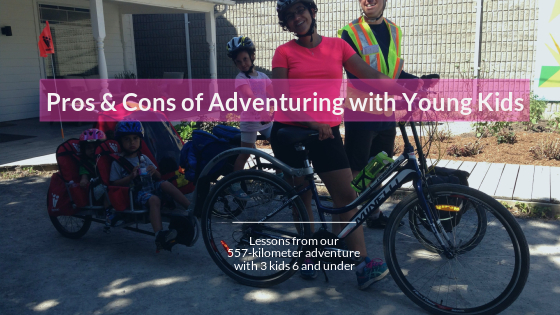 Those are some of the pros and cons of our adventure with our kiddos. In our minds, the pros far outweigh the cons, and we’re ready to hit the road again. While we don’t have a route planned or date set yet, we’re definitely dreaming up the next big trip. Have you been on an adventure with your kids? What do you think are the pros and cons?